For this project I chose to incorporate more of my own experience into the piece of art that I made. I tried not to focus on very specific styles throughout the course but the idea of showing personality through art. I’m often inspired by music and I tried to build a theme that resembles why I love music and how I see music that is pleasant to me through a visual. 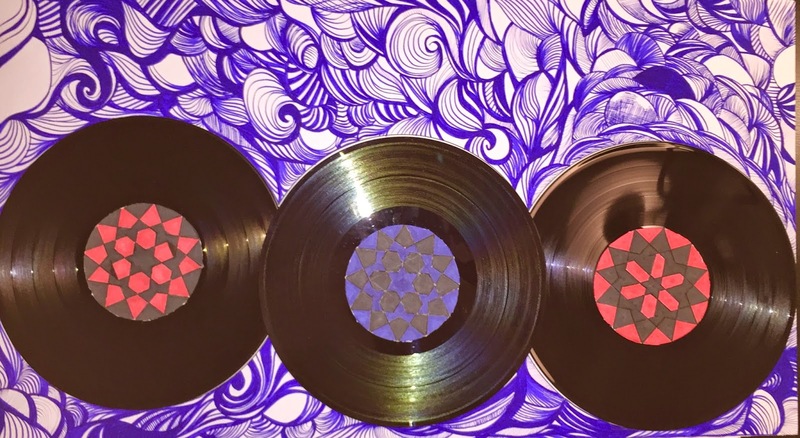 I placed three of my favorite vinyl next to each other and tried to draw patterns around them that resemble waves and floral shapes stemming from the music. The music flowing out of the pale black discs that may seem standard and mass-produced each can have a unique and different wave of its own. Since I am Muslim and maybe though of as someone who wouldn’t listen or enjoy music for religious reasons, I was encouraged to chose this subject matter to disproof that and embrace the musical side of myself. The fact that “Athan” (calling for prayer) is musical in its own way. We prefer to listen to a person that reads the Qur’an in a melodic and pleasant way. I put different versions of arabesque style stars in the middle of each vinyl to represent the soul of the record. I chose to include as much of my personal inspirations as possible. I didn’t research any artists in purpose and I tried to put my inspiration into this art project.